A Tonk's Tail... err, Tale...: Happy...WHAT...Day?? Maxwell: Allie's always telling me to 'tend to my knitting' whenever I ask her to go easy on the Bra-- uh, I mean Faraday. But it does match my eyes. Maybe I could give it a go. Let me see if I have this right: is it 'fang one, perl two'? Though why they say you have to do it in public is beyond me. Especially when the instructions say there's slipping involved. Wait. Is this one of those dangerous Contact Sports??? Happy National Knit in Public Day! There is a day for everything isn't there? Where do you guys FIND these days?! Haha, I've never heard of National Knit in Public day! Why in public...it's beyond me, too! Watch out for the needles. It is the knitting needle part I find scary! Oh my gosh! MMA knitting! Have fun unraveling that work, your peeps will be thrilled, MOL! It IS a pretty good match with your eyes! What a great day! LOL! My daughter just took up knitting and has made some of the cutest hats! 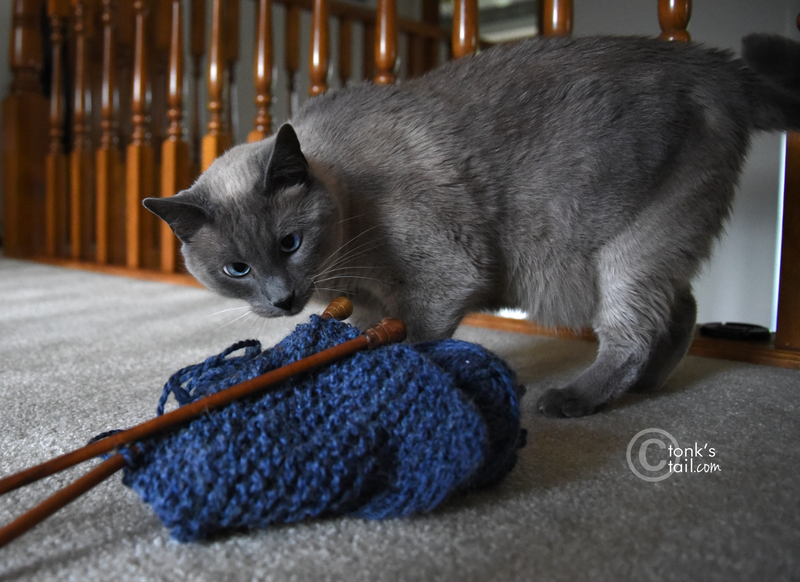 What are you knitting? I love the color. We love how that yarn matches your eyes Maxwell. 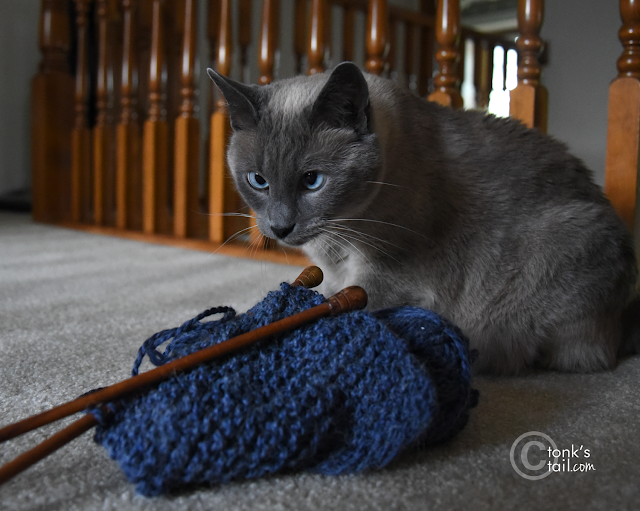 Angelique's idea of knittin involves attackin da yarn balls. Nobody here can knit but I could sure have fun with that stuff! Mommy says: "dern! I need to learn to knit!" 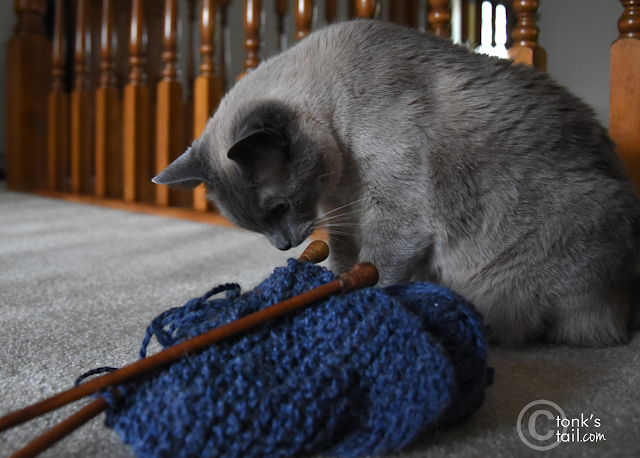 It should be Happy Play With Yarn Day! Uh oh, Maxie, didn’t you have your “fangs one” removed? MOL! Knitting and yarn is meant to be played with although those wood things look lethal. Your mommy knits in PUBLIC????? She's very brave!! Hey! you missed National Tartan Day it was April 6th.. cause really, we NEED to see Maxwell and Faraday wrapped in Tartans..